John "Jack" Joseph D'Arcy, III, 74, passed away on September 22, 2017. He was born on April 17, 1943 in Birmingham, AL to Doris and John D'Arcy, Jr.
Jack had a life-long passion for flying and cars, specifically Corvettes. He was taught to fly at a very early age by his father and gained experience flying cargo in the early 60's. He was a flight instructor for Burnside-Ott, Opa Locka, FL, until getting hired by National Airlines in 1965, where he met his wife, Marty. 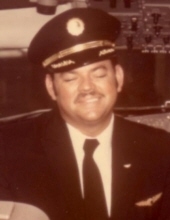 He had a long and rewarding career as he moved from National Airlines to Pan Am, and finally Delta Airlines, where he finished 40 years of distinguished service in the commercial airline industry. He is survived by his wife of 46 years, Marty D'Arcy, his son, Brian D'Arcy, and two other children, Mary D'Arcy Cantu and John J. D'Arcy IV. A celebration of life will be announced in the near future for family and friends. In lieu of flowers, the family requests donations be made in Jack's memory to either Southern Grace Hospice (http://www.southerngracehospice.com), or the Fayette Fire Foundation (http://www.fayettefirefoundation.org). To send flowers or a remembrance gift to the family of John "Jack" Joseph D'Arcy, please visit our Tribute Store. "Email Address" would like to share the life celebration of John "Jack" Joseph D'Arcy. Click on the "link" to go to share a favorite memory or leave a condolence message for the family.